The Nova is my most popular longboard model, and for good reason. It has a wide wave range and can be ridden as a single-fin, 2+1 or twin-with-trailer (a la Infinity Cluster-V). 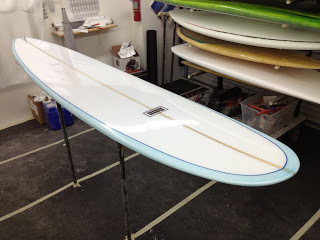 I build this model from 9’0″ to 10’6″, with thickness depending upon rider weight and experience. Here’s the latest in the popular “Ice Blue” Tint finish. No extra charge for the fancy pinline corners and the “through-the-box” leash loop. Board’s dimensions are 9-6, 17-7/8″ x 23-1/8″ x 13-3/4″ 3-1/8″ thick. This board was finished last week. Next up is a 5-stringer 7-6 Nomad and a 5-4 Mini-Widget Quad. Photos coming soon….